Customer to supply all bare PCB’s and components. We recommend that you send extra parts due to possible attrition during the pcb assembly process. ALL unused parts will be promptly returned to you. We will supply all/partial components and Bare PCB. Eliminate the hassles of coordinating multiple vendors, pieces and parts. Place one purchase order and be done. 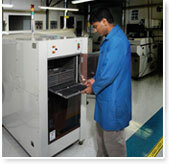 You’ll get clean, accurate printed circuit board assemblies on-time with a 100% satisfaction guarantee.